Leland Stanford Mansion State Historic Park 800 N. St., 2 blks. from the Capitol, (916) 324-0575. 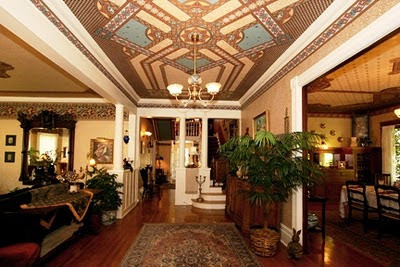 Tu-Sun; tours on hr., 10am-4pm; due to official uses of the mansion, tours may be cancelled or restricted at any time. $5, 6-17 $3. This restored 4-story, 44-room, Mansard-roofed mansion was originally built for California governor, senator, and railroad baron Leland Stanford and his family. In addition to tours, it is used by the State of California as an official reception center. An introductory video is screened in the back of the well-edited gift shop about 15 minutes prior to tour time. It reenacts life for the Stanfords in the grand house—they were here only from 1862 to 1863--and then its later 87-year stint as a refuge for children in need. The tour begins in the Ballroom, then moves on to the Billiards Room, the Greater Parlor,the huge Dining Room where formal dinners lasted three hours, the Family Library which doubled as the after-dinner Smoking Room, and the Sitting Room with an unusual whistle intercom. A narrow Bathroom holds a rare tin tub, and Toy Room displays some of Leland Junior’s toys. (Leland Stanford, Jr., after whom Stanford University was named and who was the Stanfords’ only child, was born here in 1868. He died of typhoid fever in 1884, when he was just 15.) The tour ends on the Sun Porch. More things to do in Sacramento. Calderwood Inn 25 W. Grant St., 3 blks. from plaza, (800) 600-5444, (707) 431-1110. 6 rooms. Some fireplaces. Unsuitable for children under 12. Afternoon snack, full breakfast. No smoking. Horticulturist Luther Burbank was a good friend of the original owner of this 1902 Queen Anne Victorian, and he assisted in the design and development of the home’s original front yard landscape. Among that which remains today are large cedar, cypress, and redwood heritage trees. The house is set back from the street amid a private little forest and is surrounded by informal areas to relax and perhaps contemplate colorful koi. Delightful features of the house include exquisite hand silk-screened wallpaper by Bradbury & Bradbury of Benicia—even on the ceilings—and a large front porch complete with wicker couch swing. Each room features interesting antiques and a unique decor, and some have clawfoot tubs. This was the first house in town with two indoor bathrooms, and now it has eight. The owners also own four wineries, including Wilson Winery and Mazzocco Winery, and guests get to do some tasting each afternoon. Walnut Creek branch remains open. Royal Exchange 301 Sacramento St./Front St., Financial district, (415) 956-1710. L-D M-F; $-$$. 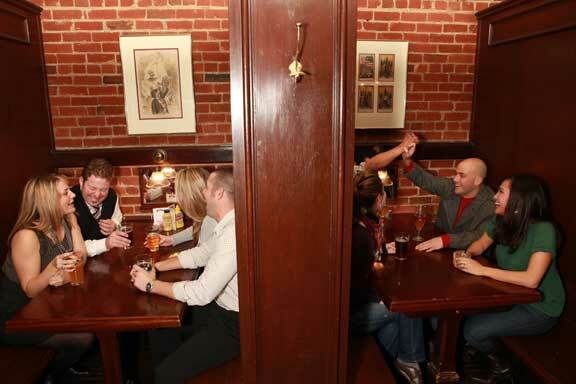 In the simpler times when this corner pub bar opened (it was in 1972, not so long ago--when Alcatraz became a national park and the first episode of “The Streets of San Francisco” aired) only two beers were on tap and only hot dogs and cold sandwiches were on the menu. Now there are 32 different beers on tap—including a clean, crisp Amstel Pilsner lager from Amsterdam and a full-bodied, smooth Trumer Pils from Berkeley--and the dog has been joined by hamburgers both big (1/3 pound) and bigger (1/2 pound) as well as veggie (portobello mushroom). Less pub-style grub includes a tasty Genoa-style lazy-man’s cioppino and a grilled salmon salad with mango salsa. All this and cocktails, too! One of my favorite things is the many enclosed wood booths that surround the two center wood bars. Why, after half a beer, you might actually think you’re in the jolly U.K. A take-away window outside makes a quick bite possible. Reclaimed: Paintings from the Collection of Jacques Goudstikker This show tells the story of how one Jewish family fought for the return of an extraordinary artwork collection looted by the Nazis during the WW II. A vast collection of masterpieces owned by Jacques Goudstikker, a preeminent Jewish art dealer in Amsterdam, were almost lost forever to the Nazi practice of looting cultural properties during World War II. But in 2006, after years of working with a team of art historians and legal experts, Goudstikker¹s family successfully reclaimed 200 of his paintings from the Dutch government--one of the largest such claims ever resolved. This show features nearly 45 pieces, including “Winter Landscape with Skaters” by Jan van Goyen and “Still Life with Flowers in a Vase” by Hieronymus Galle, as well as original documents and photographs, and explores the historic restitution of the artworks to the rightful heir. This is the only West Coast venue for the exhibition and will be its final showing. Runs through March 29, 2011. Curious George Saves the Day: The Art of Margret and H. A. Rey The lives and work of the creators of the famous monkey are explored through almost 80 original drawings and ephemera (journals, hand made cards, photographs, and more). Details of their lives emerge—the years spent in Rio de Janeiro where H. A. Rey had a pair of marmosets as pets and wore a large broad-brimmed hat; as the Nazis arrived, their flight from Paris on bicycles that Rey built of parts; another narrow escape from Europe thanks in large part to their drawings—that show up often in the couple's famous stories. Runs through March 13, 2011.
more about the Contemporary Jewish Museum, including the deli restaurant (scroll down). Ritz Carlton Highlands 13031 Ritz-Carlton Highlands Ct., in Truckee, (530) 562-3000. 6 stories; 170 rooms. All gas fireplaces. 1 adult pool, 1 child pool; 2 hot tubs; full-service spa. 3 restaurants; room service. Valet parking only, $35/night. $25 resort fee. The quiet road off the main highway that leads up to this grand hotel provides a 4-mile drive through spectacular mountain scenery (located at an altitude of 6,941 feet, it is high enough for some people to experience the effects of altitude sickness). Because builders left as many trees as possible, the hotel appears nestled into a hill, as if it has been here for a long, long time. Guests walk up steps from the lower entrance into a lobby with large granite-slab floors. The high ceiling is meant to mimic a tree’s canopy, and the smooth wood-beam supports mimic its branches, while the two-story-tall field stone-and-granite fireplace, with multiple hearths, is reminiscent of its trunk. Tall windows bring in tree and mountain views. A “living roof” decked with plants is just outside atop the porte cochere and sports a view stretching for 25 miles. In winter, guests can ski-in, ski-out from a large patio that leads into a ski rental and storage facility. 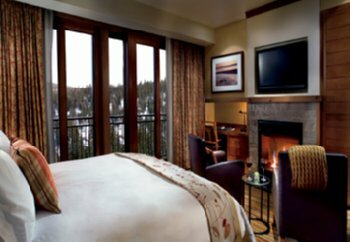 Most rooms have good views of the mountains, trees, and ski lifts from their big opening windows, and many have step-out balconies. Well-appointed Manzanita restaurant (B-L-D daily; $$-$$$+.) serves California cuisine with “a mountain vibe.” Coffee is Peet’s, and o.j. is fresh-squeezed. It features an open kitchen with adjacent communal chef’s table and full cocktail service, and outdoor seating is available in good weather. Mountain Blue Market offers quick counter service and lighter fare as well as take-away, while The Living Room bar let’s guests warm up near the fireplace and order contemporary American light fare and cocktails. Most guests take at least one meal down the mountain about 1,500 feet in the Village at Northstar. It is reached by a free 9-minute ride in an enclosed six-passenger gondola with a killer view. The center of the village is a skating rink—ice in the winter, roller in the summer—and restaurants and shops aplenty surround it. Free live music and outdoor movies are sometimes scheduled. More things to do at Lake Tahoe. Osteria Coppa CLOSED 139 S. B St., downtown, (650) 579-6021. D Tu-Sun; $$-$$$. Reservations advised. 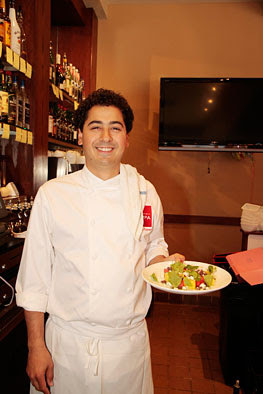 Contemporary Italian fare includes housemade pastas and artisanal pizzas. Diners here sit at tables covered informally with butcher paper and are encouraged to share items. My dining partner and I found a perfect dinner in a shared beet salad atop a thin, flavorful bed of avocado mousse; tagliatelle topped with a traditional unsaucy, meaty Bolognese; exquisitely succulent chicken al Mattone (boned and grilled under a brick) with Brussels sprouts and butternut squash puree; and chocolate lava cake with Bi-Rite roasted banana ice cream. My only disappointment was that I didn’t have room to taste a few of the other unusual pastas-- wild nettle puree-flavored pappardelle noodles tossed with lobster mushrooms, and bigoli tube pasta with red wine-braised duck and pumpkin. Cocktails and a list of pleasant wines by the glass are available. Note that service is slow and the noise level high, so don’t be in a hurry and bring the kids! Here are some travel articles to inspire and help you plan some spectacular getaways. Burger Barn 5942 Dunsmuir Ave., (530) 235-2902. No credit cards. Think decent burgers, good-but-overpriced veggie burgers, sandwiches, hot dogs, root beer floats, soft serve ice cream, and shakes. Those who are really hungry can order up the Barn Buster special: two half-pound burgers, a giant order of fries, and two drinks. Sit in the cozy inside or outside on the patio overlooking the town’s quiet main street. More things to do along Highway 5. Bosworth & Son General Merchandise 21060 Geyserville Ave., (707) 857-3471. Daily from 10am. Obed Bosworth established this general store in 1911, and now his son, Harry Bosworth, carries on the family tradition with his dog, Willie, who plops on the old wood floors wherever he pleases. The store sells everything from cowboy wear to heritage seeds to food and wine to burial plots (in addition to being president of the town’s historical society, Harry takes care of nearby Olive Hill Cemetery).